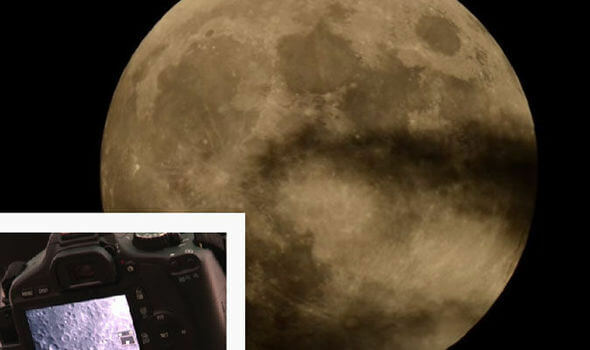 A SKY watcher who spends hours filming the Moon with high-definition telescopic cameras says years of research has convinced him the ‘moon is a hologram’. A YouTube user has published a series of videos which crazily suggest the moon is a man-made illusion and covering something else up.He developed the out of this world theory after he caught on camera something he calls a “lunar wave” which he claims shows it is a hologram.His latest video of a “lunar wave” to be posted online was filmed on Sunday, and he says he was able to predict when it would happen because they are “fixed events”.Bizarrely YouTube user Ccrow777, of the Crow Discovery Project, said he is not alone in his theory the moon is not all it seems.He said: “I am going to hit you in a way that is going make you think tin foil hat, but I’m not going to apologise for that. “I have been at this for a long time, I have been relentless in my research and in filming and observing the moon and everything that happens and it is true, from the people I have talked to, and there are other people talking about the moon being a hologram, and quite a few people are aware of this. It has been suggested it is a malfunction or illusion within the camera, but Ccrow777 argues he ruled that out because the wave only affects the lunar surface and no other area in shot. Others have suggested atmospheric pressure caused the effect – in a similar way to heat =haze or that it could be caused by engines of planes – two theories he also rejects. A quick search online reveals a number of other sites, posts and videos where people suggest the moon is fake, an illusion, or created artificially. People who viewed his videos have mixed opinions, with some buying into it. While Nuno Patro added: “Have you considered it could be the refraction of a cold front or two layers of different atmospheric pressures? He claims after posting the footage online he was contacted by three individuals who claimed to have been in positions that meant they knew more than the general public, and the moon was indeed a hologram.He then discovered former research by Russian scientists who speculate the Moon could be a huge artificial space station and the whole solar system could be fake.Despite subscribing to such an extraordinary conspiracy theory, when interviewed Ccrow777 sounds completely rational.He said: “My guess is it’s not just a rock in space, there is a lot going on up there. To me its clear now we live in an artificial system.”If you look at moon maps no two ever match up. I have come to believe it is an illusion, and part of a control system we live in.”When pressed on things like lunar eclipses, which are filmed all over the world, he maintains they are all faked.He said: “It is all staged. There are hundreds of objects that transit the moon during an eclipse. There is a control system behind the moon and it is something to do with the sun. Is it the system we have been told about or is it another system? “I predicted the next best chance to film a lunar wave would be between September 20 and 30 and low and behold it happened. “I have known the truth about our moon for a little over one year. In that time I have re-confirmed what I know many times. When I saw the Russian research it not only confirmed what I had come to know – it was perfectly spot on and then some – equinoxes – wave times – everything.